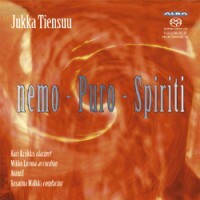 Jukka TIENSUU: nemo (1997); Puro (1989)*; Spiriti (2005)**. Kari Kriikku* (clar), Mikko Luoma** (accordion), Avanti!, Susanna Mälkki (cond.). Alba ABCD 258 (1 SACD) (http://www.alba.fi/). 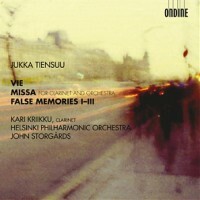 Jukka TIENSUU: Vie (2007); Missa (2007); False Memories I-III (2008). Kari Kriikku (clar), Helsinki Philharmonic Orchestra, John Storgårds (cond.). Ondine ODE1166-2 (1 CD) (http://www.ondine.net/). 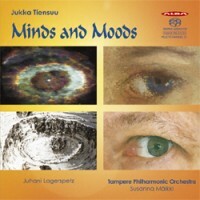 Jukka TIENSUU: Alma III: Soma (1998); Mind (2000)*; Mood (1999); Alma II: Lumo (1996). Juhani Lagerspetz* (pno), Tampere Philharmonic Orchestra, Susanna Mälkki (cond.). Alba ABCD 224 (1 SACD) (http://www.alba.fi/). Incorporating electronics and microtones, Jukka Tiensuu (b. 1948) finds enchanting colors for every ensemble he handles. The comfortably dissonant vocabulary suggests Xenakis, yet there are neoclassical contours and forays into the spectralists’ harmonic terrain. Harmonics, glissandos, and clusters interweaving to create alluring episodes, just as quickly dissolve. Modern music tends to be aggressive with soured dissonance. Tiensuu finds a playful, less ponderous route. Tiensuu’s forms sound like free-flowing structures. I don’t hear recapitulations or sonata-allegro or variation patterns. Fresh material sneaks in, whirls at center stage and slinks away. There’s little urgency for Classical development. The composer doesn’t seem interested in Romantic culminations or apotheoses. Tiensuu neither discusses his music nor provides program notes. The titles should suffice. Certainly the free forms permit a wide degree of interpretations. Some may know Tiensuu’s work as a harpsichordist with programs that straddle periods up to modern masterpieces. In 1987 Finlandia released The Fantastic Harpsichord wherein Corrette follows Xenakis (FACD 357 with Soler, Tiensuu, Saariaho, Sciarrino). The Exuberant Harpsichord (Ligeti, Morley, Rameau, Sallinen, Mâche, et al.) and The Frivolous Harpsichord followed. My first exposure to Tiensuu was Arsenic and Old Lace (1990) on the Arditti’s from Scandinavia (Auvidis Montaigne MO 782033 with Lindberg, Sørensen, Saariaho). Here a microtonally (mis)tuned harpsichord leads the string quartet on a rocky ride. Compared with Lindberg and Saariaho, Tiensuu’s quintet is the most overtly entertaining. With respect to recent Tiensuu orchestral releases (not covered here is Alba ABCD 287 which offers chamber music), absent program notes are easily dismissed crutches. It’s easier to listen and contemplate titles. The nemo–Puro–Spiriti release may be the best introduction, then perhaps Vie–Missa–False Memories. Two recent works make strong impressions. Vie, a Concerto for Orchestra, speeds across contrasting terrains. Motives are discovered, turned slightly and put away. The five-section accordion concerto, Spiriti, emphasizes the instrument’s similarity with breathing embellished with gauzy colors and spontaneous motion. An extended piccolos and contrabasses passage demonstrates Tiensuu’s flair with instruments. Puro and Missa are clarinet concertos. Tiensuu has written quite a lot for clarinetist Kriikku. Puro is perhaps the more conventional. The soloist departs now and again from the occasionally rambunctious orchestra. An opening string ritornello reminds one of Xenakis. Where other Tiensuu works suggest the composer’s preference for melodies and motives, Puro has its fair share of unexpected rhythms. Missa adheres to the anticipated Introitus, Kyrie, Gloria, Credo, Sanctus, Agnus Dei, and Ite. The mass’s context isn’t readily apparent. Perhaps the soloist plays the celebrant or reacts to the individual parts. The winds, suggesting electronics, produce echo effects in Agnus Dei. Scored for orchestra and sampler, nemo (intentional lower case n) might mean “no one” or Verne’s hero. The sampler provides animal sounds, including birds and whales. A day at the zoo? Sampler also appears in Alma II: Lumo and Alma III: Soma. If “lumo” and “soma” are Finnish, Google posits “enchantment” and “cute.” Alma I: Himo (1995) has a tape part that Google proposes as “lust.” Soma starts with quick bursts, rolls about and promptly quits. Lumo shimmers with a slower pulse. False Memories’ three parts, Review, Nostalgy, Trauma, are easily interchangeable: The work seems more concerned with motion than portraiture. Is that the Tristan chord poking through in Nostalgy? Mind is a four-part piano concerto movements of which are Earth, Air, Water, and Fire. I didn’t get the connection with the elements, nor does the concerto work for me, owing to the piano’s failure to quite take center stage, or perhaps because it cannot sing like a clarinet or accordion. Tiensuu’s quick decay, typical of his harpsichord writing, is less effective for piano. However, there are some marvelous effects imitating organ chords and the octave-plus-fifth passages reminiscent of Saint-Saëns’ Egyptian concerto. Tiensuu favors four-letter titles. Fitting the Alma–Mind–Soma–Lumo pattern is the shiniest of its companions, the nine-minute Mood with its sprightly staccato for full orchestra. And yet “Moods and Minds” doesn’t hit the mark. Can it be just the unsettling cover? While Mälkki is key to both Alba discs and fine as always, I wouldn’t want to disparage the Tampere Phil. This is hard music well-dispatched by all involved.